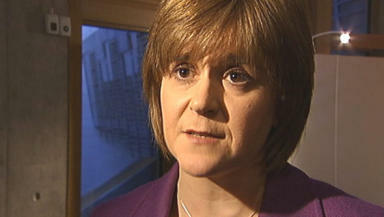 The SNP deputy leader has told her party conference of ambitious new plans to improve the nation's health. Three hundred lives could be saved each year by a new scheme to catch cancer early, the Health Secretary has said. Nicola Sturgeon was speaking at the SNP's spring conference at the SECC in Glasgow. She pledged that, if the SNP was re-elected in May, it would launch a national initiative to improve cancer detection. Ms Sturgeon, who is the party's deputy leader, said the scheme would be backed by a £30m cash boost and would involve increasing NHS capacity. She also said the party would bring back its proposals to set a minimum price for alcohol. The alcohol-pricing plan was widely supported by health professionals but opposed within the Scottish parliament. As the conference drew to a close, Ms Sturgeon urged delegates to "win this election for Scotland's sake", and to "campaign like we have never campaigned before". Earlier at the conference, the education secretary said a re-elected SNP government would halve the number of pupils being taught in "crumbling" buildings, and provide job security for teachers. Michael Russell also said the SNP would further reduce class sizes, and introduce Scottish Studies as a subject. He said: "Teacher unemployment has given me more sleepless nights than anything else. It is a waste of talent and it is a waste of commitment. "So today I want to make a very clear and sincere pledge. I am going to leave no stone unturned, no option unexplored and no ideas untested to ensure that we can take forward a constructive agreement with our teaching workforce." Explaining the idea behind Scottish Studies, Mr Russell said: "We will take the idea of Scottish language ... Scottish literature, Scottish history, Scottish geography, Scottish culture. We will wrap those things up into an offering for schools called Scottish Studies and we will link it to all other subjects."